Plato was a student of Socrates (c.470 - 399 BC), and is primarily remembered for his Theory of Ideas. Just as it was possible to perfectly define a triangle Plato reasoned that abstract virtues, such as love, truth, and beauty could also be defined. More than that, whatever we see of these virtues in this world is but a shadow of the original which exists in the unseen world of forms. The ability to recognise that something in this world resembles its eternal ideal is innate: acquired before the soul is clothed in its physical body. Platos aim was to educate those who had the ability to comprehend them to concentrate on the realities rather than the images which they perceived with their flawed natural senses. The importance of this theory to our discussion becomes clear in any discussion of the early church fathers. In a work written in dialogue form entitled the Timaeus Plato gave his account of the origin of the visible world. This work had a tremendous influence on Christian thought from the time of the second century Apologists to the Renaissance. Even today there is considerable disagreement among scholars about its dating and how it is to be reconciled with his other works which is not surprising, as even his younger contemporaries could not agree on its meaning. Plato calls the maker of the heavenly bodies the Demiourgos (or Demiurge), or more frequently God (as opposed to the gods), but also Father and begetter. However, Platos Demiourgos is only a symbol of Soul, and so Plato is not using the word God (theos) in the Judaeo-Christian sense. In fact the Timaeus is no more than a cosmological myth, demonstrating that the universe is more than just matter, but is a living entity. This Craftsman or Technician acting out of his own goodness brought order to eternal formless matter. For God desired that so far as possible, all things should be good and nothing evil; wherefore, when he took over all that was visible, seeing that it was not in a state of rest, but in a state of discordant and disorderly motion, He brought it into order out of disorder, deeming the former state in all ways better than the latter. The Demiourgos is not, like Yahweh, omnipotent for he "must bend to his will a material that is to some extent recalcitrant. Otherwise, being wholly good himself, he would have made a perfect world (29d-30a)." Nor did he form the universe alone, for he calls subordinate gods into existence to help him build according to a predetermined pattern or Form. From the above it is easy to see why Philo of Alexandria and the Christian Platonists mistakenly saw in Platos work a description of the Creation and used it to bridge the gap between what they believed and intellectual paganism. Two developments of Platos ideas are relevant to our present study. The first is Middle Platonism (sometimes known as pre-Neoplatonism) which became fully developed in the 1st century AD, and contained a distinctly religious element. Many Middle Platonists postulated a supreme "Divine Mind" and Jewish and Christian writers interpreted Platos ideas of forms as "thoughts within the divine mind". The amlagam produced emphasised on Gods transcendence, but also accepted Gods immanence in the physical world. It also fostered a dualistic view of soul and body (the spiritual being seen as superior). Christians viewed this as a triumph because it meant that much of contemporary thought could be accepted without denying either the bodily resurrection of Christ or the goodness of the physical creation. like Philo, they did not believe that truth could conflict with truth and were confident that all that was rationally certain in Platonic speculation would prove to be in perfect accordance wit the Christian revelation. Their unhistorical approach and unscholarly methods of exegesis of texts, both pagan and Christian, facilitated this confidence. 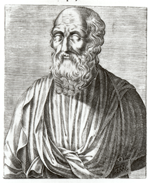 Middle Platonism retained its pre-eminence in the minds of Christian writers even beyond the end of the 4th century even after the rise of its successor, Neoplatonism. Neoplatonism is sometimes described as "the final form of Greek philosophy", and by others a last-ditch attempt "to revive and restate classical philosophy as a viable alternative to the Christian faith". It was formulated by the pagan philosopher Plotinus (AD 205-270) and represents a selective systematisation of the works of Plato, plus elements from Aristotle and Stoicism. Neoplatonists did not see themselves as following a new philosophy: they believed that they had re-discovered the true meaning of Platos teachings. It was Neo-Platonism that had the greatest influence upon Christian theology from the fourth century until it was displaced by Aristotelianism in the Middle ages. David J. Melling, Understanding Plato. (Oxford: Oxford University Press, 1987), 98-99. Colin Brown, Christianity & Western Thought, Vol. 1. (Leicester: Apollos, 1990, 34. W.K.C Guthrie, A History of Greek Philosophy, Vol. 5. (Cambridge: CUP, 1978), 241. E.g. Plato, Timaeus 41A, 41E, 68E, 69C; Guthrie, Vol. 5, 253, n.2. E.g. Plato, Timaeus 41A; Guthrie, Vol. 5, 253, n.2. A. Hilary. Armstrong, An Introduction to Ancient Philosophy. (London: Methuen & Co. Ltd., 1947), 47. Plato, Timaeus 48E-51B; Paul M. Blowers, "Creation," Everett Ferguson, ed. Encyclopedia of Early Christianity. (New York & London: Garland, 1990), 240. Plato, Timaeus 30A; Plato, "Timaeus, Critais, Cleitophon, Menexenas, Epistles," trans. Rev. R.G. Bury, Loeb Classical Library, Vol. 7. (London: William Heinemann Ltd., 1981), 55. Guthrie, Vol. 5, 256; Melling, 150: "There is nothing in the rest of the dialogues to support the inference that Plato believed the Forms themselves were created by God, on the contrary, their existence is constantly emphasised..."
 A. Hilary Armstrong, & Henry J. Blumenthal, "Plato and Platonism," Encyclopedia Britannica Macropedia., Vol. 25, 15th edn. (London: Encyclopaedia Britannica Inc., 1992), 900. J.N.D. Kelly, Early Christian Doctrines, rev., 1960. (San Francisco: Harper, 1978), 19. Everett Ferguson, Backgrounds of Early Christianity, 2nd edn. (Grand Rapids: Eerdmans, 1993), 365. Ferguson continues: "Philo of Alexandria is the first extant author explicitly to give this formulation: the ideas are the thoughts in the mind of the Supreme God of Judaism. In view of the Philo's general lack of philosophical originality and incorporation of existing philosophical commonplaces it is conjectured that this reconciliation of Plato and Aristotle may go back to Antiochus [of Ascalon (c. 130 -c.68 BC)]." Brackets mine. Berchman, Robert M. "Neoplatonism," Encycloipedia of Early Christianity, 640-643; Armstrong & Blumenthal, 900. R.T. Wallis, Neoplatonism. (London: Duckworth, 1972), 3, 16-17; Peter Brown, Augustine of Hippo: A Biography. (London: Faber & Faber, 1967), 91. The Christian Neoplatonists included Gregory of Nyssa (c.330 - c.395), Marcus Victorinus, Augustine (354-430), Pseudo-Dionysius and Boethius (c.480 - c.524). Robert M. Berchman, "Plotinus," Encyclopedia of the Early Christianity, 738. Plato, Dialogues. B. Jowett, 4th edn. Oxford: Oxford University Press, 1953. R.E. Allen, ed. Studies in Plato's Metaphysics. London: Routledge and Kegan Paul, 1965. D.L. Balás, Christian Transformation of Greek Philosophy Illustrated by Gregory of Nyssa's Use of the Notion of Participatuion," Proceedings of the American Catholic Philosophical Association, Vol 40 (1966): 152-157. James H. Burthess, "Plato, Philo, and the Author of Hebrews," Lutheran Quarterly 10 (1958): 54-64. W.S. Cobb, "Plato on the Possibility of an Irreligious Morality," International Journal for Philosophy of Religion 25.1 (1989): 3-12. Gabriela Roxana Carone, "Plato and the Environment," Environmental Ethics 20.2 (1998): 115-133. J. Daniélou, Gospel Message and Hellenistic Culture. Philadelphia / London: Westminster / Darton, Longman & Todd, 1973. C.J. DeVogel, "On the Neoplatonic Character of Platonism and the Platonic Character of Neoplatonism," Mind, Vol. 62 (1953): 43-64. E.R. Dodds, "The Parmenides of Plato and the Origin of the Neo-Platonic One," Classical Quarterly, Vol. 22 (1928): 129-142. Leonard J. Eslick, "Plato as Dipolar Theist," Process Studies 12.4 (1982): 243-251. R.M. Jones, "Chalcidus and Neo-Platonism," Classical Philology 13 (1918): 195-208. P. Travis Kroeker, "The Theological Politics of Plato and Isaiah: A Debate Rejoined," Journal of Religion 73.1 (1993): 16-30. V. Bradley Lewis, "Globalization and the Eclipse of Natural Right: What We Might Learn from Plato and the Other Greeks," Communio: International Catholic Review 27.3 (2000): 431-463. J. Patrick Mohr, "Ultimate Reality and Meaning in the Cave Analogy of Plato's Republic: A Further Contribution to URAM Plato Studies," Ultimate Reality and Meaning 15.3 (1992): 202-215. T.B. Mooney, "Plato and the Love of Individuals," Heythrop Journal 43.3 (2002): 311-327. Richard Norris, "Irenaeus and Plotinus Answer the Gnostics: A Note on the Relation Between Christian Thought and Platonism," Union Seminary Quarterly Review 36.1 (1980): 13-24. Charles Partee, "The Soul in Plato, Platonism, and Calvin," Scottish Journal of Theology 22.3 (1969): 278-295. John M. Rist, Eros and Psyche: Studies in Plato, Plotinus and Origen. Toronto: University of Toronto Press, 1965. ISBN: 0802051448. pp.250. George Rudebusch, "Plato on Knowing a Tradition," Philosophy East and West 38.3 (1988): 324-333. G.C. Stead, "The Platonism of Arius," Journal of Theological Studies, n.s. 15 (1964): 16-31. C. Steel, The Changing Self: A Study on the Soul in Later Neoplatonism: Iamblichus, Damascius and Priscianus. Brussels: Koninklijke Academie voor Wetenschappen, Letteren en Schone Kunsten van België, 1978. L. Tate, "Plato and Allegorical Interpretation," Classical Quarterly 23 (1928): 142-54; (1930): 1-10. Pieter W. van der Horst, "Plato's Fear as a Topic in Early Christian Apologetics," Journal of Early Christian Studies 6.1 (1998): 1-13. G. Vlastos, ed. Plato, 2 Vols. Garden City: Anchor, 1971. R.T. Wallis, The Neoplatonists. London: Duckworth, 1972. Otis M. Walter, "Plato: The Most Maligned Philosopher," Religious Humanism 17.3 (1983): 128-133. T. Whittaker, The Neo-Platonists, 2nd edn. Cambridge: Cambridge University Press, 1928. E.A. Wyller, "The Platonic Concept of Rhetoric in 'Phaedrus' and its Effect Upon Christian Rhetoric," Tidsskrift for teologi of kirke 63 (1992): 241-252.